Hi All, I've finally managed to get started on my midlife crisis... with the purchase of a 2002 Z3 3.0i Roadster in Cosmos Schwarz. Never really had a decent car in the past, always driven practical family wagons, or petrol savers, so really looking forward to enjoying a little bit of silliness on the weekends. The car is a definitely not new, it has some pretty heavy stone chipping on the bonnet, and rear wheel arches. Its also got some strong swirl marks and scratches in the paintwork from rough cleaning. The Softtop could do with a refurbish and the back windows cloudy, and I've got some work to do to bring the interior up to a high standard... but it'll give me something to do, and practice on, without being scared of breaking the bank. I intend doing an upgrade to the exhaust. Its stock exhaust is just a little to gentrified for me, Id like it to let people know its not its smaller brother (the 2.2 version) without shaking the house to bits every time i start it up I am probably also going to put some new 18'' wheels on when the rubber next needs replacing, and maybe a few other little upgrades. 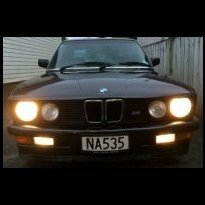 Now this looks fun Oh for more garages .... https://www.trademe.co.nz/motors/used-cars/bmw/auction-1580254546.htm $17.5K 117KMs aftermarket cushioned-leather centre console clear rear wind deflector AC Schnizter gear knob. Electric folding soft-top is in really good condition. Hi, Just from one to the other minute the dasboard light of my gearbox flicked on. I had to drive in limp mode 30km further to home. At home I was able to log in with Inpa, and Inpa told me that there was a problem with the pressure regulator solenoid valve. Normally I fix stuff myself, but at the moment I just don't have the time for it. So I brought the Z to a transmission specialist, and he had a look at it. He opened up the pan and found metal dust and swarf inside. The metal parts had shorted out the solenoid valve, hence the message on Inpa. He told me that that a overhaul would cost at least $4000 plus GST. I had to think that over... The next day my son spoke to our neighbour (BMW fanatic) who was at a local garage that morning asking for a quote for an auto to manual conversion for his E36. The garage said to him that it would cost probably around $3000. That brought me also on the same idea, why not a conversion? The garage said that the conversion of the Z cost probably a bit more. So the latest week I am browsing the net about conversions to manual. The garage who wants to do it for me rather have me sorting out the parts than him. He says that is cheaper to do. I am doubting between an E46 six speed box or an E36 5 speed. If I converse to 6 speed I can keep my LSD 4.44 and have normal rpm. Later I can go to 3.46 and have a nice cruise rpm. If I choose for a normal 5 speed, I have to change my diff to a 3.46 anyway. Any recommendations here? My garage gave me two addresses for parts. He pointed me to HellBM and SDEuropean. HellBM mailed back that they only do inhouse conversions and don't sell conversion sets. I haven't heard form SDEuropean yet (weekend) I saw some traders on tardme selling conversion sets. One trader is offering a set for $1250, which looks reasonable to me. But when I asked for a E46 six speed it is $3k for the gearbox only. What kind of prices are these 6 speed boxes. What can I expect? Are there other (reliable) sources where I can get my parts, prefered conversion sets? Any thoughts about this?